Country Manager for Esso Exploration and Production Guyana Limited (EEPGL)- ExxonMobil’s local subsidiary- Jeff Simons (right) briefing Guyana’s parliamentary committee on natural resources. At the head table are (left to right), Junior Minister of Natural Resources, Simona Broomes; Senior Minister of Natural Resources, Raphael Trotman, his Permanent Secretary, Joslyn Mc Kenzie and head of the Environmental Protection Agency (EPA), Dr. Indarjit Ramdass. Seated at the back are Commissioner of the Guyana Forestry Commission, James Singh and Commissioner of the Guyana Geology and Mines Commission, Newell Dennison. Although “associated” natural gas has been found along with an estimated 1.4 million barrels of oil offshore Guyana, a top official of ExxonMobil on Wednesday said because of the comparatively small gas find it would not be immediately feasible to exploit that fuel. Country Manager for Esso Exploration and Production Guyana Limited (EEPGL)- ExxonMobil’s local subsidiary- Jeff Simons explained that the gas comes out with the oil. Initially, he explained, a lot of gas would be produced in the early days but as the amount of oil reduces the amount of gas will also. While Minister of State, Joseph Harmon told a news conference earlier Wednesday that the natural gas would be used to generate electricity, produce fertilizer and make liquid propane gas for domestic consumption, Simons said investing in gas production and delivery facilities would depend on the amount. “The difficulty with associated gas instead of a pure gas reservoir is that a lot of the monetization of that gas requires investment which requires the gas stream that’s consistent and expanded over more than five or six or seven years,” he told a bipartisan parliamentary committee of natural resources. The EEPGL official said the difficulty is getting sufficient gas to build a Liquefied Natural Gas (LNG) facilty over a long period. Asked by the Chairman of the natural resources committee, Odinga Lumumba whether it would be the Guyana government’s interest to find an investor in natural gas, Simons said EEPGL was conducting a number of studies before returning to government on a number of things that could potentially work with the gas but until a feasible option is identified it is best to store it until more gas is found. “Right now, the only real economics to the gas are to put it back in the ground and keep it there until we have a more significant gas find that we can generate some kind of plateau of gas production,” he said. He cautioned against building a US$1 billion or US$1.5 billion gas pipeline to the shore for a small amount of gas to be delivered to the market..
With ExxonMobil already having found 800 to 1.4 million barrels of oil about 200 kilometers offshore Guyana, the company has begun exploratory work on Liza 3 well. If projections fructify by early next year, the Country Manager said the reserve could increase to as much as one billion barrels of which three quarters will be oil and the remainder gas. 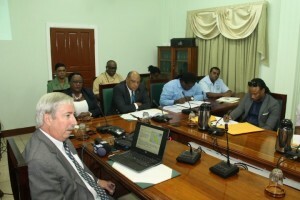 Simons told the parliamentary committee hearing that EEPGL has already applied for an environmental permit and then would be pursuing its development plan, front-end engineering and acquiring Floating Production Storage and Offloading tankers to begin extraction and production of oil by 2021.
training, business and corporate social responsibility projects. At least 50 to 100 persons would be aboard the two Floating Production Storage and Offloading tankers.